Dan Wray (center, in red shirt) organized volunteers from the Winona Lake (Ind.) Grace Brethren Church. 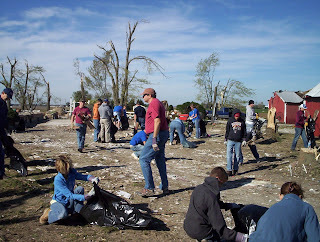 Also helping with tornado clean-up were members of the Grace Community Church, a Grace Brethren church in Goshen, Ind. (in blue shirts).